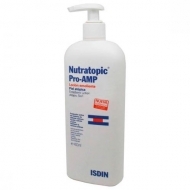 Maintains the pH of the skin. 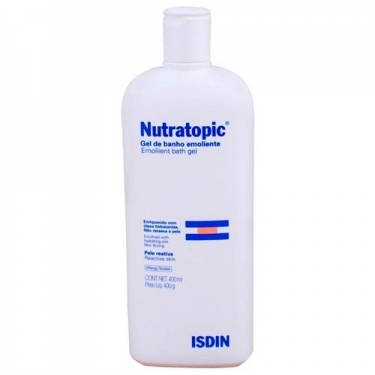 DESCRIPTION: Nutratopic Pro-Am Gel from Isdin is a soap-free cleaning product for the daily hygiene of atopic skin, reducing the risk of skin irritations. 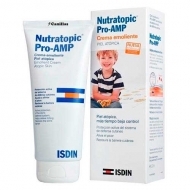 Helps to strengthen the skin's defense system and moisturizes thanks to its very high content in emollient oils. It helps to avoid the risk of infection by inhibiting bacterial adhesion thanks to its formulation with Rhamnosoft. 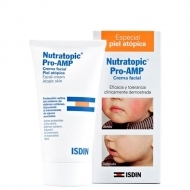 It maintains the pH of the skin, a key factor for the prevention of new eruptions. No soap, preservatives, perfume or dyes. Apply daily on wet body skin. Remove with plenty of water.